Heat oven to 350 degrees F. Coat a (12 cup) muffin pan with cooking spray or line with paper liners. To make the cake, in a medium mixing bowl, sift together flour, baking powder, meringue powder and salt. In a large bowl, using a mixer on medium speed, beat together butter and sugar until creamy - about 2-3 minutes. Beat in eggs and vanilla until well combined - about 2 minutes. Beat in buttermilk and sour cream until combined -about 1 minute. Reduce mixer speed to low and gradually beat in flour mixture until just combined. Divide batter into muffin cups; bake 15 minutes or until cupcakes are well risen and cake springs back when touched. Cool on wire racks. To make the filling, whisk egg yolk in a small bowl. In a small saucepan over medium heat, whisk together cream, sugar, cornstarch and salt until well combined; continue to cook, whisking frequently, until mixture is hot. Gradually pour half of the hot cream into egg yolk, whisking constantly. Whisk egg yolk mixture back into saucepan with remaining cream. Cook mixture for 1-2 minutes, whisking constantly, until thickened and coats the back of a spoon. Strain custard into a small bowl and stir in butter and vanilla until combined. Chill custard over an ice bath, in refrigerator, until it reaches room temperature. To make the ganache, in a medium bowl, stir together chocolate and cream. Melt mixture in the microwave for 1 minute, stirring every 20 seconds, until melted and smooth. To assemble cupcakes, scoop out a tiny bit of cake from the center of each cupcake and place a spoonful of custard into the center. 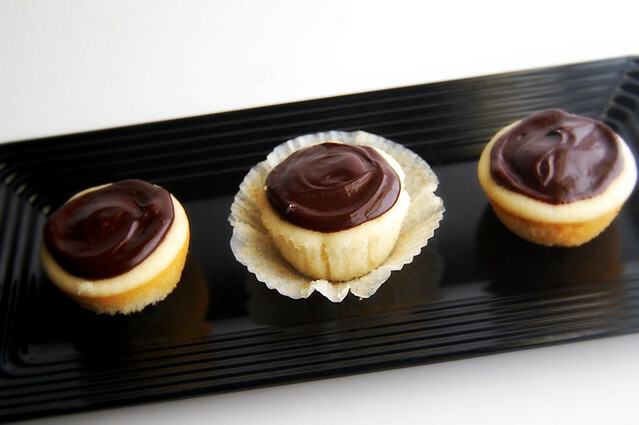 Spoon and spread chocolate ganache on top of cupcakes. 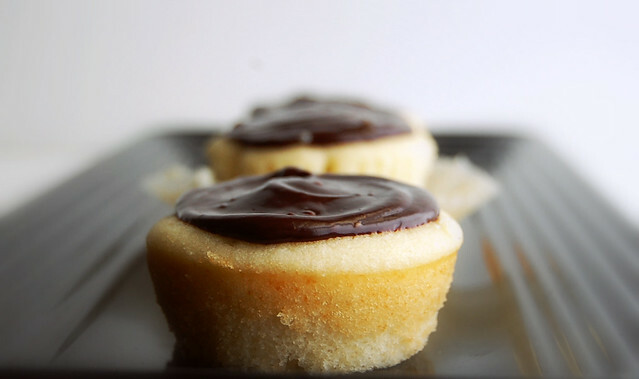 65 comments on "Boston Cream Pie Cupcakes"
i have been on the hunt for a boston cream pie cupcake recipe! my suitemate requested that i make them; she will love these! they are adorable and look delish! One quick question though..what exactly is 'Meringue powder'?? These are so cute! I really like Bostom Cream Pie, except I'm often disappointed with the custard--crème patissiere is the only one that does it for me! I'm glad to hear your family is OK.
EMILY! I am soo happy for you and your family. That is amazing news. YAY! These look great but I have never liked boston creme pie... :/. I wish I did!!! I think I just don't really like the custardy part. Yay! So glad to hear that your brother in law is doing well. Also glad to see all the new recipes you're coming up with. Believe it or not, I've never eaten Boston cream pie before, but your cupcakes look absolutely delicious. Speaking of new recipes, if you ever find a box of cinnamon cornflakes, you'll have to try my recipe for cinnamon cornflake cookies http://sweet-as-sugar-cookies.blogspot.com/2010/10/12-weeks-of-christmas-cookies-2.html. They taste just like churros. I'm so glad to hear such good news about your brother-in-law!! And these cupcakes are darling and I'm making them--maybe even today. (and I'm pretty sure I gave you the idea since you mentioned in a comment on a post where I'd mentioned BCP that you'd have to try making it. ;) But I love your twist by making them cupcakes! And your cake part sounds much more yummy than on the recipe I used. Can't wait to try these!! Glad to hear the good news! And whoa those cupcakes look amazing! All that chocolate and yummy cream filling...delicious! the best cupcake I've seen! Happy early blog-a-versary! I think a great post would be to put up your all-time favorite recipes that you have concocted. Or maybe top 3 cookies, top 3 cakes, top 3 breads, etc. And then maybe your top 3 least favorites and what you learned from the experience. Welcome back! Glad to read the good news; and thank you for sharing such a scrumptious cupcake recipe! You've turned one of my favorite cakes into yummy cupcakes! I love this combination of flavors. I'm always scared of making custard...but I think it'll be worth it. I am so glad everything is okay now (: Good luck! First of all, I love Boston cream pie, but my eyes always end up bigger than my stomach, and I make myself sick, so these are perfect! Secondly, I saw you in Wal-Mart the other day, and I almost approached you, but didn't, because I didn't want you to think I was some weird stalker. Now I wish I'd said something. Other than the excited "I read her blog! ", which I hissed to my sister. Such excellent news! Thank goodness everything is going well with your b-i-l. Big hugs!!! Those are pretty gorgeous cupcakes. I think your blogiversary needs to be celebrated by you reaching out to your most faithful readers. A little package of Sugarplum's goodies to those of us who are devoted to you would never be a bad idea. I'll let you choose what to make, while I wait by the mailbox. Hey, i just made these too! I think yours look better though. I forgot to do the cone scoop method and just inserted the filling up from the bottom and the cupcake soaked it up! These look great. I also can't wait to see what you have stored for your blogiversary. Maybe do a round up of posts/recipes that received the most hits? So so glad to heard that your bro in law is awake and recovering! Everyone needs some good news in their life. These cuppie cakes look lovely. My dad's favorite cake is BCP, so I'll be sure to make these for him one day! So relieved to hear the good news! Boston Cream Pie was so special to me in my childhood. I ate it for the first time in grade school and fell in love and I considered it such a treat when I could have it again. Too bad as I grew older I learned that there are a lot of mediocre recipes out there. I would eat these cupcakes before I went to the chocolate fountain. Totally mean that! so glad to hear about your brother-in-law :) these cupcakes look yummy too.... can't wait to make these bad boys! Great to read that Mike is pulling through! The photos are wonderful. Makes me want to reach out and taste! wow, these look perfect & DELICIOUS! i'll have to give these a try soon! 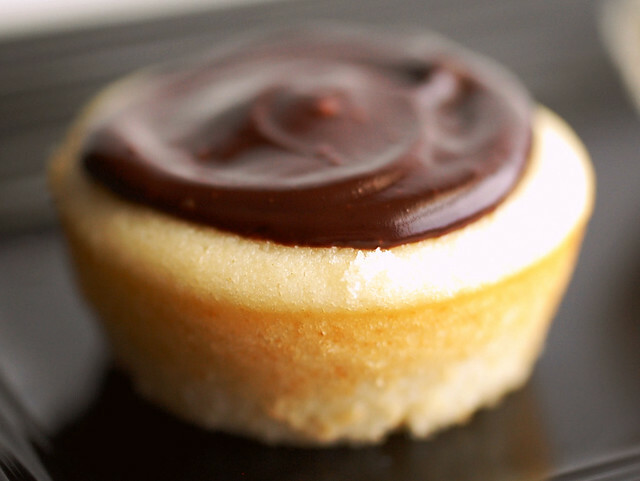 These Boston cream pie cupcakes look just stunning!! Kissses from Brussels to you! Hi! I'm a 25 year old self taught professional baker in Chicago. I work as the only baker in charge of all the baked goods at an up and coming cafe near downtown. I am not a huge blog follower but yours I come back to for great ideas! I've been thinking of doing Boston Cream Pie Cupcakes for a while now... thanks for the final push. A lot of my clients are vegans, So I might try to adapt this for them. I use Agar powder for vegan pudding/fillings .. maybe it'd work in lieu of traditional custard! Glad your brother in law is doing well.And I wanted to say that these are some particularly nice photos - I wish I had that talent with my camera! will you be mowing the yaaaard when youre done with the caaaar? am sooooo glad to hear mike is doing better!! I'm so happy for you and your family! I've been praying for your brother-in-law. And selfishly, I'm so glad you are baking again! I'm ready for more desserts!!! that was the best news i've read today--so relieved that he's doing ok and on the mend!! WOW! These look amazing! Your pictures are excellent! I love you, hahah. I will definately try these! so glad about your bro-in-law! and so lovin these cupcakes! These are from heaven. The middle of them looks seriously divine...I love cakes that use that trick when there's something/filling/icing in there. So glad to hear your brother in law is improving! 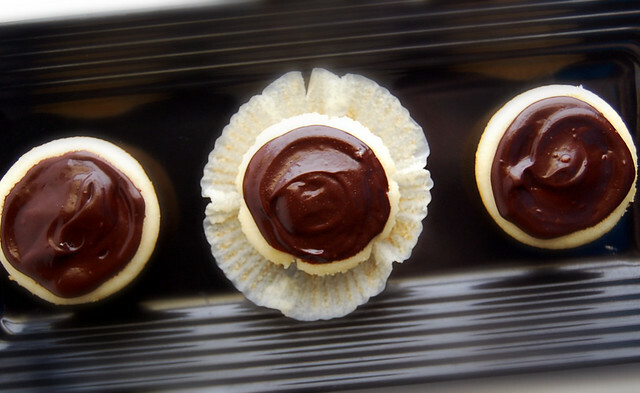 These little boston cream pies look delish! firstly--super glad your family is doing better. Yummm Emily these look SO yum!! You know? Boston cream pie is my favorite. And now...in cupcake format?! Happy blogiversary!! Wow, what a great recipe! Looks spectacular. Oh wow, these look so good! Delicious. I LOVE custard, warm or cold ;) My mom always made us hot custard to eat with apple pie. I have to try and make these ASAP! Congratulations on 3 years of blogging - that's a wonderful achievemnt and a testament to your passion for food and baking! And many more blessings on you and your family, especially your BIL. I've never really eaten a bostom cream pie actually, but looking at these cupcakes sure makes me want to! I am so glad that things are looking up for your brother-in-law's recovery. As silly as this sounds coming from blog land, I've been worried and thinking good thoughts for you all. Huh....I'm pretty sure I need you to make me some of these. I am soooo glad to hear the good news about your brother-in-law! I hope he continues to gain strength and get better with each day!!!! I will continue to send prayers!! As for the cupcakes...MMMMMMMM is all I can say! They look absolutely wonderful... will have to try them...my little ones would LOVE them!!! Ooooo girl! These look precious and almost too good to eat! Yay I'm so glad to hear about your brother-in-law! Also, your cupcakes look amazing :). I'm so glad your brother-in-law is doing better Emily, what a relief for your whole family. Oh, and your cupcakes look great - I've seen the Martha Stewart Boston Cream Pie cupcakes, but I like yours more because you put the filling on the inside instead of between little layers! Crafty Tuesday, it's made by Wilton. It's basically powdered egg whites and sugar. I love the flavor and lightness it brings to cakes. PAMELA, that's nuts!! Say hi to me! Danielle, oh no! Did they taste okay? Cpck, I'd love to make the vegan recipe once you figure it out! Thanks for reading! t, I will enter it for you! I just tried making these - the cakes look nothing like your pictures (more like a steamed sponge than crumby cakes) - maybe because I skipped the meringue powder? Also, my custard was pretty runny and I think I dug out too big a hole, so I ended up having to put the dug-out tops back in to make a smooth surface for the chocolate. Haven't tasted them yet but the separate components taste good :-) any hints on what I was doing wrong, appreciated! Anna, these cakes were pretty spongy, actually. I would say mine were more spongy than cakey. If I had to guess... I would say maybe you didn't cook the custard enough to thicken up. Or perhaps I had a heavy hand with the cornstarch? I'm sorry you had problems with the recipe. I'll have to make these again to trouble shoot. I've made ALOT of cupcakes..but never Boston Cream Pie ones--yum! Yes, I've realized now I probably should've cooked the custard for longer - didn't follow the instructions too well at this part. "Oh no" I'll have to make a second batch :-) They still taste good when they're a bit soggy - in fact I love soggy cake stuff like tiramisu and trifle! So glad to hear your BIL is recovering well. Love these cuppies - they have custard and chocolate, two of my favourite things ever - whatmore could a girl want? This is really great! I am not that good with baking but I will definitely try this out. Easy and simple recipe but is really fulfilling! Will try this out this coming weekends! Thanks! I really love baking, this Boston Cream Pie cupcakes is new for me and these look absolutely delicious. I will try this with my Mom. Hope we enjoy it! Thank you! So I have never made or ate a boston cream pie so i have a stupid question: if you are making them the day before you serve them 1. can you fill and ice them ahead of time? 2. Do you refrigerate them or keep them at room temp.? thanks for the help ahead of time. My friend and I made your cupcakes. They are super delicious but they are not even close to as pretty as yours were. And the custard...was a disaster. It was a very weird thick consistency. We don't know what happened :( But overall great delicious recipe! Anon, those aren't stupid questions. You can definitely make these a day ahead. Store them in the refrigerator. Ana, well I'm glad you like them! My filling was pretty thick too. If I had to take a guess, I'd say you cooked the filling a touch too long. I made these lovely morsels last week... my boyfriend loved them for his birthday!